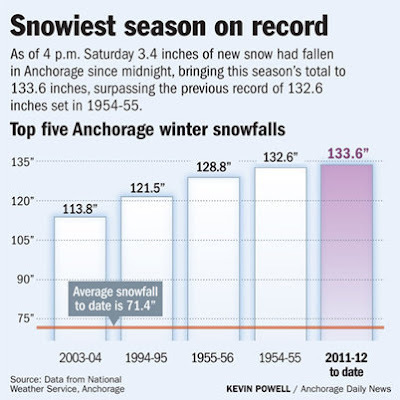 It is official...the winter of 2011-2012 is the snowiest in Anchorage history. As of 4 PM on Saturday, 133.6 inches of snow had fallen on Anchorage and by the close of the weekend 134.5 inches of snow had fallen. The previous record of 132.6 inches was set during the winter of 1954-1955, before Anchorage was even a state. Typical snowfall in Anchorage reaches around 75 inches. When did the snow start falling? According to Alaska Dispatch, it all began Oct. 30 when the snow season got off to a humble start with 1.1 inches at the National Weather Service forecast office. Snowfall has been fairly consistent all winter. Snow reached its greatest depth of 36 inches in late February and early March. Will the snow ever stop? Probably...but perhaps not for a few weeks. Traditionally, only about four inches of snow falls in April; however, amounts can range anywhere from 0-30 inches. In 2008, two feet of snow fell in April and roughly 20 inches fell over the last weekend. When the record was broken in 1955, 18 inches of snow fell in April. What does this mean? The State of Alaska Department of Public Safety has extended the deadline from April 15 to May 1 to change from winter studded tires to summer tires. In addition, more street cleaning will lead to even higher snow dumps, which have already maxed capacity. What is worse? Anchorage should probably brace for one of the worst "breakup" seasons ever. Ugh. Honestly, it is kind of fun to be a part of and witness history. Although a headline like "the hottest summer in Anchorage history" may be a bit more pleasing, the largest snowfall is epic, especially because Anchorage already receives more snowfall than many cities in the United States. P.S. I apologize for the lack of pictures. My camera battery died and I forgot to take the time to recharge the battery...oops!